Washington, D.C., Arlington, VA, Schaumburg, IL, and Ottawa, ON (August 1, 2018)—The latest Actuaries Climate Index™ data reported today by organizations representing the actuarial profession in Canada and the United States show that the five-year moving average of climate extremes across the two countries reached a new record high in fall 2017. “Increased precipitation and continuing rising sea levels drove Actuaries Climate Index values for the United States and Canada higher in fall 2017,” said Doug Collins, chair of the Climate Index Working Group. With the fall 2017 data, the five-year moving average of the Actuaries Climate Index reached 1.19, a new record that surpasses the previous record of 1.14. The seasonal Actuaries Climate Index value increased to 2.00 in fall 2017, from the previous level of 1.59. The elevated moving-average and seasonal index values reflect continued deviation of climate and sea level extremes from historically expected patterns for the two countries. 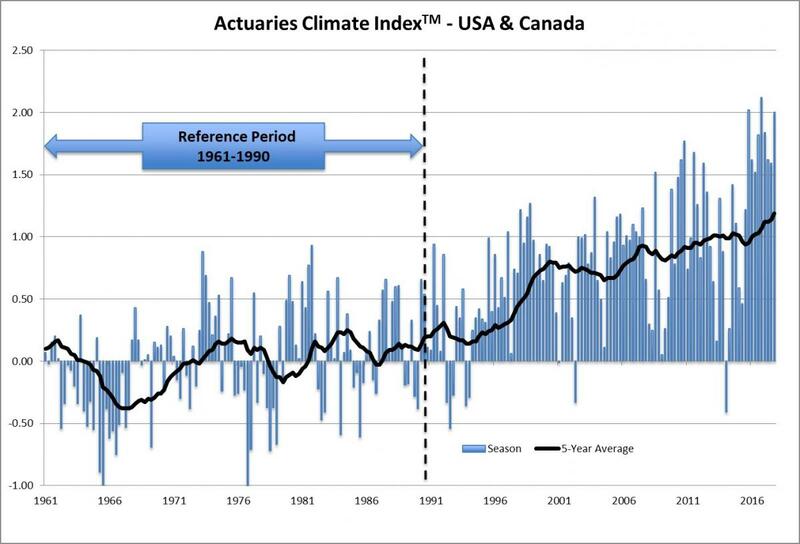 The Actuaries Climate Index is based on analysis of seasonal data from neutral, scientific sources for the six different index components collected since 1961. The index measures changes in extremes of high and low temperatures, high winds, heavy precipitation, and drought, as well as changes in sea level, expressed in units of standard deviations from the mean for the 30-year reference period of 1961 to 1990 for the United States and Canada combined. The index, sponsored by the American Academy of Actuaries, the Canadian Institute of Actuaries, the Casualty Actuarial Society, and the Society of Actuaries, is designed to provide actuaries, public policymakers, and the general public with objective data about changes in the frequency of extreme climate events over recent decades. Updated values are posted quarterly on ActuariesClimateIndex.org as data for each meteorological season becomes available. The organizations are also developing a second index, the Actuaries Climate Risk Index, to measure correlations between changes in the frequency of extreme events as measured by the index and economic losses, mortality, and injuries. The Canadian Institute of Actuaries (CIA) is the national, bilingual organization and voice of the actuarial profession in Canada. Its 5,000+ members are dedicated to providing actuarial services and advice of the highest quality. The Institute holds the duty of the profession to the public above the needs of the profession and its members. The Casualty Actuarial Society (CAS) is a leading international organization for credentialing and professional education. Founded in 1914, the CAS is the world’s only actuarial organization focused exclusively on property and casualty risks and serves over 8,000 members worldwide. Professionals educated by the CAS empower business and government to make well-informed strategic, financial and operational decisions. With roots dating back to 1889, the Society of Actuaries (SOA) is the world’s largest actuarial professional organization with more than 30,000 actuaries as members. Through research and education, the SOA’s mission is to advance actuarial knowledge and to enhance the ability of actuaries to provide expert advice and relevant solutions for financial, business and societal challenges. The SOA’s vision is for actuaries to be the leading professionals in the measurement and management of risk.